When you tag along with Mark Anderson for some pocket water steelheading, be ready to put in your time scrambling and rambling down and then back up steep sloped river canyons. Anderson loves to explore places that make you feel more mountain goat than two-footed angler. And we kept moving along a small Oregon coast range river, looking for the small pockets of whitewater where the “eager biters” like to hold. It was a day marked by brilliant sunshine during an unusually extended dry period. 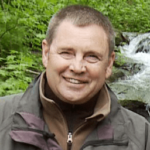 “Pocket water is the very head of a river’s run where it riffles before it levels off and smoothes out,” noted the longtime angler. Anderson likes to cast into a river’s hidden places where water narrows and races so to reach deep holes that hold big fish. “Fish will tuck in at the head of that hole because it provides cover for them and they feel safe,” he said. He entices fish to bite colorful hand-tied feather covered “jigs” that ride the river under a simple bobber. It is easy to admire the simplicity of his rigging, for it’s back-to-basics fishing: a lure, some leader, a bobber and a cast, and you’re fishing. It’s so simple anyone can try. Even me! The big, ten-pound steelhead, marked by a red crimson bar the length of its lateral line, charged deep toward the river bottom and then twisted and shook the hook as it swam away to even deeper water. Mark’s the owner of his favorite local shop called “First Bite Jigs.” It’s his Oregon-grown business and he has created thousands of feathered jigs based upon a lifetime of experience that often has him thinking like a fish. “The first thing a fish sees is the color. The color is critical in attracting them and then it’s the action and the presentation. So, shrimp-pink is just an all-time favorite color for salmon, steelhead and trout. It’s akin to something they have seen before,” he said. For the past 12 years, Anderson’s First Bite Jigs has been out in front and successful in an increasingly competitive fishing lure business. He insisted that spreading the word about jig fishing for steelhead and salmon is his ultimate goal – no matter how many competitors he faces each year. At a favorite location, high in the rivershed, Anderson cast across a small pocket of whitewater where he thought a fish might hold. In a matter of seconds, his bobber disappeared. 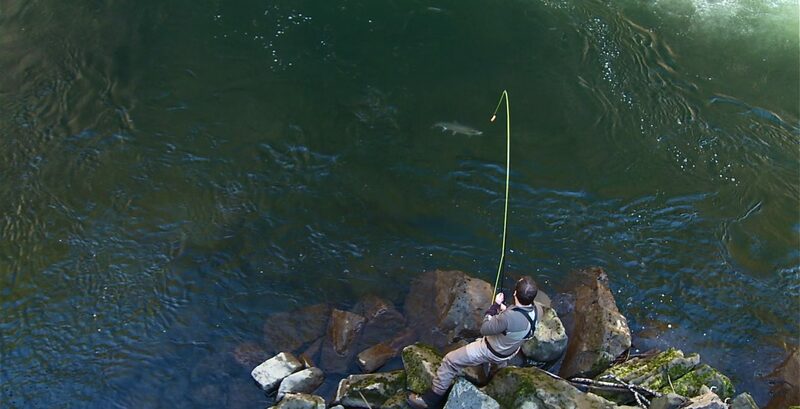 “There he is!” noted the confidant angler who had experienced this routine many times before. It was a promise that made the day long hiking adventure that included hours of bouncing from spot to spot, and was so worthwhile. 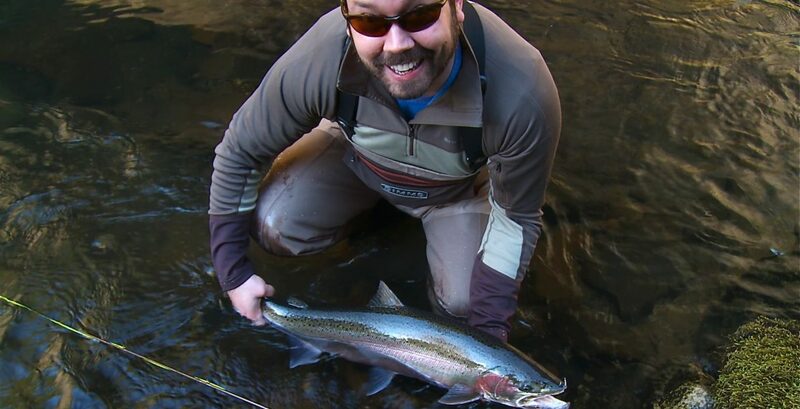 Anglers should spend a day and get to know a river well by exploring for Oregon’s pocket water steelhead. 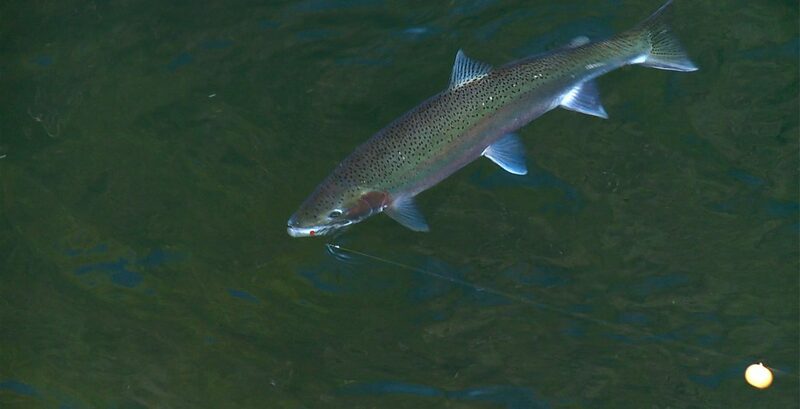 In addition, check out the Oregon Department of Fish and Wildlife’s new guide to Summer Steelhead fishing. It will help you take advantage of a forecast run size of more than 400,000 summer fish returning to the Willamette and Columbia Rivers beginning in May.